Sadly on March 3, 2016 Sheena passed away quietly in her sleep. She was 12yrs old. She had a large inoperable tumor in her abdomen. It was discover in the fall last year. Even then she held on unwilling to give up her family. This amazing girl left behind a huge legacy and paws to fill. If you wish to read her obituary please click on the link below. I am the type of person that believes that Service Dogs work hard so they need to play hard too. They can feel stress just like we can. 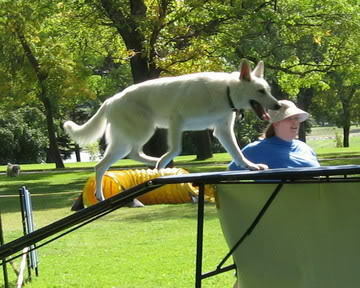 Sheena's favorite way to eliviate stress was FLYBALL. You just mention the word and she would be spinning circles, running to the door and back to us in excitement. The above picture was taken at her very first tornament in 2006. Sheena does have her FD and FDX titles in Flyball. We ran with a team called FastAntic's. And it was so much fun. Sheena's fastest time to run was 5.4 seconds. As you can read in the About Me section Sheena was purchased in the hopes she would become my PSD. At the time there was only 1 other PSD in all of Canada. They were not very well known. Sheena surpassed all expectations in her training and by 2 she was a PSD. The second in Canada and the first in Western Canada. In her career she opened many doors. We encountered many business owners who had had bad experiences in the past with people trying to pass off pets as Service Dogs. So they had closed their doors to most if not all Service Dogs. We took on the additude that the best way to change that was to educate the business owner and let them know they had rights too and what kinds of behaviours they should expect from a Service Dog team. Then we would ask them to give us just one chance. 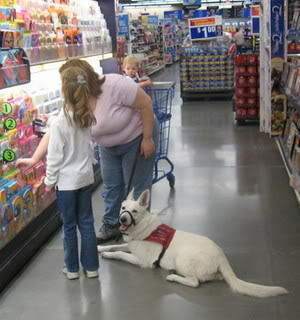 If Sheena behaved as explained then they agreed to open their doors to Service Dog handlers in the future. Sheena never failed this test. And in so doing businesses became more Service Dog friendly. Sheena and I even attended the meetings prior to the writing of Alberta's Service Dog Act in 2009. The one we attended was held in a busy mall on the second level. I had no idea that the government people running the meeting were watching from the second level but when I got up there they instantly asked me who trained her. I stated I did. They thought she had been trained by a facility as her behaviour was impecable. During the meeting Sheena was perfect. I was there to try and ensure that Owner Trainers would still have an option to Owner train. I wanted a government access test created that owner trainers could take with their Service Dogs to get the government ID cards. Because of Sheena's behaviour they listened seriously to what I had to say. We were one of the reasons the loop hole was created in the ACT to allowed for owner trainers. Hopefully in the future we will see that access test idea come to fruition. Sheena has had a long career and now does not do public access, though she still tries to work in the home. She changed my life in ways that no meds or therapy ever could. She gave me the confidence and independance that I never imagined with how faithfully she did her duties. I will never be able to thank her enough. 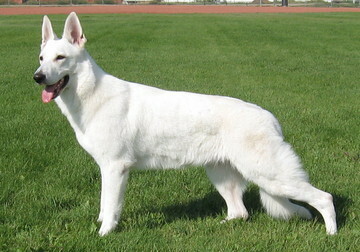 This is Sheena's sire. 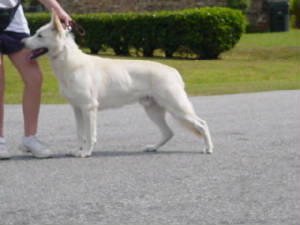 I can't find very much information about him other then his pedigree which you can see by clicking on the link. Her litter was born December 20, 2003 so it has been almost 12yrs. This is Sheena's dam. 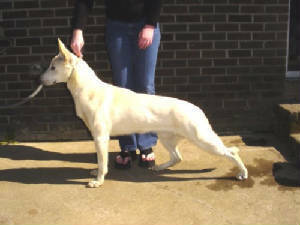 I can't find very much information about her other then her pedigree which you can see by clicking on the link. Her litter was born December 20, 2003 so it has been almost 12yrs. Sheena also loved agility. She was a dog that has always thrived on learning new things and showing what she can do. Her main issue when running a flyball course was not anything to do with her. It was me. I was too slow. So instead of making mistakes she would slow down and wait after obstacles so I could catch up. 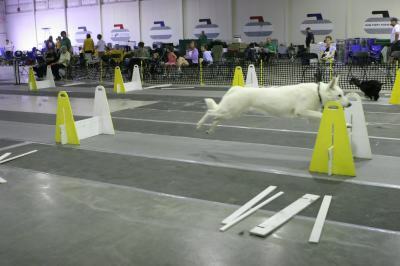 Our dog club for Flyball also did agility demonstrations at city activities in the spring and summer. Sheena and I attended many. One of the public's favorite was the high jumping contest. Sheena was the second highest jumper in the group. The highest jumper was smaller then Sheena. So as the other dogs would get eliminated the crowd would get really excited watching Sheena and this smaller dog go all out to try and beat each other. Another joy of Sheena's was children. She adored them. She thought every child needed to be kissed and still does. People say she is the perfect kids dog. She has helped countless children over come their fear of dogs after being bitten by a dog in their past. Sheena helped them see that not all dogs are mean. She has always been very gentle towards children.